This page is intended for the general public, students and government agencies who wish to understand more about termites and the Green Termite Bait System. It contains terminology and ideas that can easily be understood by the layman. We encourage your questions and invite you to contact us if you can’t find the answer here. Our experienced technicians will make every attempt to answer you promptly, honestly and accurately. Further down the page we have FAQ for professionals, university students or home owners seeking more in-depth technical answers. Before treatment they are completely non-toxic. They are not chemically treated in any way. They are simply natural radiata pine, a termite’s favourite food. When the termite bait becomes active, the ¼ – ½ gram of Termidor Dust that is applied to the bait will be mostly consumed or removed by the termites when it adheres to their bodies. 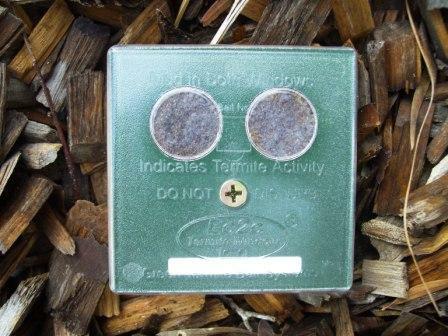 Any slight residual left within the bait will be removed when the bait is replaced 4 weeks later – after eradication of the termites is confirmed. Any Termidor residual left in the soil would be so minuscule as to be considered completely negligible and absolutely harmless to us, pets or wildlife. The same can be said if the Green Termite Bait is bait treated with an IGR such as Intrigue Dust. If the Green Termite Bait is treated with any other product, then it would be advisable to read the label and access the MSDS for that particular product to ascertain if there is any risk. How many baits do I need for an average house? The average 3-4 bedroom house on a slab will need about 20 – 30 Green Termite Baits. How far apart should I put them? The closer together the better. It all depends on your budget. We find that 2-3 metres is a good distance apart. Further than 6 metres is stretching it and increases the chances of termites finding their way to your home between the baits. How close to the house should they go? Baits should be placed as close as possible to the house but no closer than 200mm. If you are unsure, please email or fax us a diagram of your house and garden layout and we will advise you directly. This is a FREE service. If it is paving, you may be able to remove a paver and insert the bait. If it is concrete you may be able to skirt around it, keeping in mind that extra baits may need to be added to cover the extra distance more securely. You could skip over the concrete to the next available to place. However this option does open up the risk of termites finding their way to your home between the baits. As a last resort you may need to cut the concrete. A hole 103mm or larger is required. You might decide to make a tiny garden bed in the concrete – add some top soil, a Green Termite Bait, and a few attractive flowers. Do they attract termites to my house? Definitely not. Here is a fact that few people know about: Termites are more attracted by moisture than timber! So stop those dripping taps and air-conditioner drips. How do termites find the baits? Green Termite Baits are found by termites in a fairly random way. Termites are blind and travel in totally dark underground tunnels. However, correct placement of the baits will increase the chance of a termite strike. Termites search for food underground spreading out from the nest like roads spread out from a major city. And just like roads wend their way around obstacles like rivers and mountains, termite tunnels underground generally take the route of least resistance. If they hit a plumbing line they will follow it right into your house. If they find a moisture trail (from a dripping tap, leaky shower floor, cracked drain pipe, etc) they will travel along it. Termites need moisture and use it to build their mud galleries. For this reason we don’t advise the use of baits that require regular watering to make them work. The watering may be just the thing that brings the termites to your house. Once the termites are within a metre of a Green Termite Bait the scouts sense the bait and head for it. How they do this is still under scientific investigation. It is speculated that they may sense some disturbance in the soil or that the timber gives out a scent or juice that they can detect. Our experiments have shown that old rotten timber is more attractive than new timber. The longer a Green Termite Bait is in the ground the more successful it is likely to be. Our baits improve with age, unlike our competitor’s plastic bait systems that crack and break with age. Do I put the baits near the house or away from the house? We advise that the baits should be placed as close to the house as possible but not closer than 20cm. Placing them around plumbing, drainage and wet areas is excellent. They can also be placed away from the house in areas of known termite activity if you wish, but they will offer less direct protection. Is the termiticide already inside the bait? No. There is no poison of any kind pre-loaded in a Green Termite Bait. The termiticide is applied after the termites enter the bait. The termiticide will penetrate the bait and the nearby termite galleries leading up to the bait. There is no wastage as all the termiticide ends up the ground under the bait or in the bait with the termites, depending on whether a dust or a liquid termiticide is used. It is non-repellent and so the termites will remain feeding in the bait unwittingly carrying the termiticide back to the nest and sharing it through grooming, cannibalism and trophallaxis with others in the nest including the Queen. How long will a Green Termite Bait last for? The tops are UV resistant for up to 5 years. The timber part of your baits will last for about 3 – 5 years depending on how wet the ground is. Eventually they will rot. They actually get better as they get older because termites prefer decaying timber. It’s easier to eat! When you spread the initial cost of the baits over the life of the baits, you can see that they are even better value for money. How do I know if the bait is ready to be treated with Termiticide? When both holes are active the bait is ready. The pictures below show both an inactive bait, as well as an active bait with a termite strike. No need to guess… you can see with your own eyes. When both holes are active, the top of the bait is removed and the termiticide is applied. The termiticide will circulate through the bait and the termite leads attached to the bait. The 2 holes are then plugged with a special dark top, which then returns the inside of the bait to darkness, ensuring that the termites stay on in the bait, greedily eating the bait and the newly applied termiticide as well. Size of the termite colony. The number of termites ‘effectively’ treated or visiting the bait after the termiticide is applied. One thing is for sure. The nest is surely doomed after an effective application of a registered termiticide. The Green Termite Bait System works superbly with Termidor® and Intrigue® to destroy termite nests. I know where there are termites in my yard, so how should I use the baits? Green Termite Baits can be placed in areas of known termite activity. Once they are in place, all other sources of termite food should be removed and cleared away if practical. In addition to the above, we would still strongly advise that the full perimeter of the house have Green Termite Baits giving added protection. Years of testing has proven time and again that termites are often putting pressure on a home in areas of little obvious suspicion. Many people mistake termite activity for a termite nest. Termites that are feeding on a retaining wall, sleepers, mulch or timber on the ground are usually NOT the nest. A nest is usually hidden underground, often in the base or hollow of a tree or tree stump. Nest locations are often very hard to locate which is why termite baits are such a good idea. 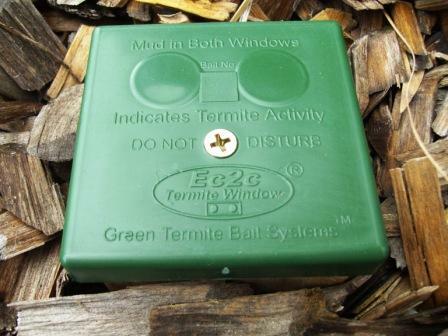 The Green Termite Bait System uses the foraging termites to carry the termiticide back to the nest, where-ever it is! The nest can be up to 50 metres away, or in a neighbour’s yard. So, if you have a neighbour who doesn’t care about the termites on their property and you are worried if they will affect your home, baits give you the opportunity to do something positive about it. I have termites in my house already. Can the baits help me? Yes they can, but we would not advise it. The Green Termite Bait System is a termite risk reduction system aimed at prevention, not cure. If you have termites already in your house call us (Brisbane, Gold Coast, Sunshine Coast) or your local professional termite expert and have the termites treated first, then add your Green Termite Bait System to help prevent the problem occurring again. Scenario: Termites are entering your house from a nest outside the house and you are unaware of their attack. They have not as yet formed a secondary nest in your house. You install a Green Termite Bait System. These same termites then find their way into a bait where they are effectively treated with an approved termiticide. The termites in the house will also die when the nest dies. The time it takes to open the top of the bait is but a few seconds, followed by just a few more seconds as the previously prepared termiticide is added. Two dark plugs are promptly placed over the application holes in place of the original windows. Because conditions are returned to “as they were” inside the bait in such a short time, the termites soon settle down again and go about their feeding. Because the termites are already well established in the bait before we apply the termiticide, they have marked the bait as a preferred source of food using special pheromones. Even if they should abandon the bait, it will only be temporarily. They will return to finish their meal and consequently ingest the termiticide and transfer it back to the nest where it will soon be passed on to the Queen (a process called trophallaxis) and she is then doomed and so is her colony with her. Score Termites V Home owner: Termites – zero damage to the home, but they got a bait. Home owner – 1 Termite Nest eliminated – Game Over! Is condensation under the windows normal? The condensation under the windows is normal and desirable. It occurs because the timber of the bait has absorbed moisture (perfect for termites) and when the sun heats the bait, a little moisture may appear in the window. It later evaporates when the bait dries out. The timber of the bait is like a sponge and will absorb or expire the moisture around it as the soil changes from moist to dry. Condensation = Inactive, no termites in the bait yet. If you see condensation then there are no major termite activity in the bait yet. Once the termites arrive and eat their way through to where the window chambers are, they will absorb the moisture and use it to build their mud under the window to block out the light. Note: They will build the mud whether there is condensation or not. Mud in both windows tells you that the bait is active and ready for treatment with an approved termiticide. Condensation or a clear window means that the bait is all clear for the moment. Is the Green Termite Bait System 100% successful? When an approved and registered termiticide is applied effectively to a Green Termite Bait, our tests indicate greater than 99% success. Occasionally a second application may be required. Due to a range of factors beyond our control we can not offer a 100% termite protection guarantee. As with all forms of termite control there always remains some risk. The Green Termite Bait System can help you to substantially reduce this risk and that is why it is both a wise and practical investment. Unlike expensive perimeter barrier sprays that are messy, highly disruptive and need renewal every few years. A Green Termite Bait System is simple, easy, low cost and tidy. The Green Termite Baits should be used as a part of a complete Integrated Termite Management program. Can you summarize the Green Termite Bait System for me? The baits are put in the gardens or lawn beside your home. Simply check them once a month. It only takes a few minutes. No termites? Good news! Relax and check them again next month. If termites are in the bait, an approved termiticide is applied to the bait by your professional pest controller. After 1-2 months the used bait is replaced with a fresh one. First the bait works as a sentinel – a termite burglar alarm. Then the termites convert the bait into their own death chamber where they can be accumulated and effectively treated with an approved termiticide. The termiticide is then taken back to the nest and unwittingly transferred by grooming, cannibalism and trophallaxis to other termites including the Queen. They die. Termidor® Dust is the preferred product. If Intrigue® dust is used, the Queen can no longer produce viable eggs or do her next moult. Often she is assassinated by her workers. Then the colony collapses because no new Queen can be produced either. Complete details of these fascinating hi-tech dusts can be found by clicking here. These answers are for experienced termite professionals and contain terminology and ideas that can easily be understood within the termite industry. We encourage professionals who have questions to contact us and we will make every attempt to answer you promptly, honestly and accurately. Termidor Dust® – Only 1/4 to 1/2 gram. Termidor® solution – 50ml at label rates, but may be more effective at lower rates. Premise solution – 50ml at label rates, but may be more effective at lower rates. Arsenic trioxide can also be used but with a reduced success rate 50-80%. Do I have to pay commissions back to Green Termite Bait Systems? Of course not! Who’d do such a thing? Is the Green Termite Bait System Australian made? Yes. Unlike many other systems where large chunks of money are heading back to the USA or China, the Green Termite Bait System is manufactured on the beautiful Gold Coast right here in Australia. The company is wholly Australian owned. Do I need a scanner? Do you really want another thing that breaks, plays up, reads incorrectly and ends up being chucked in the back of the truck? No. Our ‘Quotation & Acceptance Form’ is simple to understand and easy to complete. It has all you need to keep perfectly accurate records on behalf of your customer. Time is money. You don’t need to waste time. How long does it take to inspect the baits? An average home with 20 baits will take only 5 minutes. Longer if you stop to chat with the customer. About 5 minutes longer if you have to treat an active bait. We are not exaggerating! About 6 minutes longer if you need to replace a previously treated bait. It is quick, simple and easy. No fuss, no mess, no fiddly keys. What else can get into a Green Termite Bait? Unlike many plastic bodied bait systems, you won’t be surprised and find it full of ants, lizards, slugs, worms, redbacks, funnelwebs, or any of a host of other subterranean creatures. All you will find in a Green Termite Bait is termites! Non-targeted pests are excluded. Green Termite Baits improve with age as they get older. This is because termites prefer decaying timber. (Many termites in nature clean up fallen trees and branches in forests.) There is a point after about 3-5 years where the Green Termite Bait is past it useful life and needs replacing. At this point you may find grubs or worms in the bait. Toss it out. The top of the bait is recyclable and can be used again or kept as a replacement spare. There is a twelve month unconditional manufacturing warranty on your Green Termite Bait so if perchance it should split or crack and not be serviceable, then we will replace it FREE of charge, no questions asked. After 10 years and over 100,000 baits sold, we know just how sturdy this little beauty is! What can go wrong with the Green Termite Bait System? Everyone knows the KISS principle. Unlike several other unmanageable systems, we kept it simple. There is simply not much that can go wrong. Install it correctly in the first place, monitor it on a monthly schedule and you will be sure to please and impress your customers. You deliver the outstanding service and the Green Termite Baits will deliver great results for years to come. What about Nasutitermes, Microcerotermes and other species? You won’t find Nasutitermes or other Family Termitidae very often in a Green Termite Bait. Microcerotermes can be a nuisance and chew a bait over an extended period of time, effectively blocking other termites from the bait. Use a low label rate Termidor® solution on them and put a new bait in nearby to restore interception of other termite species that are of economic significance. Heterotermes ferox can also be a nuisance in a bait, but these should still be treated with termiticide normally as they may do superficial damage to fences, decking and occasionally houses. Better still, look around for the nest mound and dig it out if you find it. Is it 100% guaranteed to intercept and stop termites finding their way into my customer’s property? In the real world, we all know this is not possible. Any statement that implies otherwise is false. The Green Termite Bait System is simply a brilliant way to substantially reduce the risk of termites finding their way into a home undetected, as well as a great opportunity to destroy the termite’s home before they damage and devalue your customer’s most valuable asset, however due to a range of factors beyond our control we can not offer a 100% termite protection guarantee. It should supplement other traditional treatments if termites are already in a home or if the home has areas of extreme risk where baits are not practical. It is great value for money, and should be sold as prevention rather than cure. Statistically over 10 years, our success rate on fully serviced complete Green Termite Bait Systems is better than 99.5%. What if there are termites already in the house? Obviously you will need to look at several options after completing a full inspection. Better still, Termidor® dusting to active feeding areas. Perimeter treatment or partial perimeter treatment. Termidor recommended. 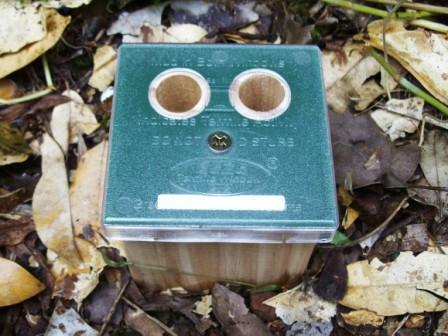 Utilise an above ground bait station if you have very little termite activity to work with. Timber treatment using a Boron based preservative. Or any good combination of the above. Plus it is always a good move to install a Green Termite Bait System around the home to compliment the above methods and help round up any other termites that may still pose further risks. We all know that in most cases there is more than one nest in the near vicinity of the home. Does the Green Termite Bait System comply with the Australian Standards for pest control? The Australian Standards 3660 & 4349 were not specifically written with Termite Baiting Systems in mind. The standards were designed for the inspection and treatment of existing houses and new houses using chemical or physical barriers. There are just 9 lines devoted to termite baiting systems out of 47 pages. (b) Application of bait toxicants. Suitably registered baits may be used in conjunction with aggregation systems or may be applied directly to areas in which termites are already known to be feeding. The action of the baits on the colony will depend on the active ingredient. Baiting systems may be used to manage or eradicate existing termite colonies and to monitor for future activity. They are not prophylactic barrier systems and might not prevent future attack. They may be used alone or in conjunction with conventional barrier systems. Baiting can be useful in chronic re-infestation situations where other methods have been unsuccessful. Baiting systems do not impede concealed termite access into a building or structure. We suggest that an external in ground termite bait system should not be purchased as a sole means of treating existing (active) termites in a house. Nor should it ever be sold as a stand alone means of termite protection for new homes. They are sold as an additional means of reducing the risk of termites gaining entry to a home. Even though they are extremely effective when used correctly, it is still advisable to suggest your customer’s home be inspected at least annually as recommended by the Australian Standards. As Murphy might say, “To be sure, to be sure.” Most people don’t get their homes checked annually. Why? We suspect price is the answer. The Australian Standards also state that NO termite management method is 100% termite proof, hence the need for inspections and follow-up treatments even on brand new homes. Disclaimer: Green Termite Bait Systems will substantially reduce the risk of termites gaining entry to your property. This is affected by three factors. 1. The number of baits you choose to install. 2. The available areas for correct placement of baits. 3. The frequency of bait inspections. Monthly checks are recommended. Fortnightly if you are north of the Tropic of Capricorn. However, as with all termite risk reduction systems Green Termite Baits™ cannot and should not be relied upon for 100% protection. Regular annual or bi-annual inspections by your respected termite professional are advised as recommended in the Australian Standards. Additional risk reduction measures may be required in certain cases. No warranty or guarantee against termites is offered or inferred by Green Termite Bait Systems or their authorised distributors. Individual Green Termite Baits do come with a 12 month defect warranty and will be replaced FREE of charge if for any reason they crack, split or become unserviceable during the first 12 months. The life expectancy of a Green Termite Bait is 3-5 years depending on the moisture content of the soil. Unlike plastic bodied systems, Green Termite Baits improve with age. This is because termites prefer decaying timber. Copyright of Green Termite Bait Systems 1996-2004. All rights reserved. How do I become a distributor or service agent? Please contact us and we will send you a starter kit for free.